EDM is considered a "non-traditional" method for metal cutting, using electrical sparks to erode material for extremely precise cuts. EDM is most often used for extremely hard or difficult-to-work metals. It has now become the 4th most popular machining method. 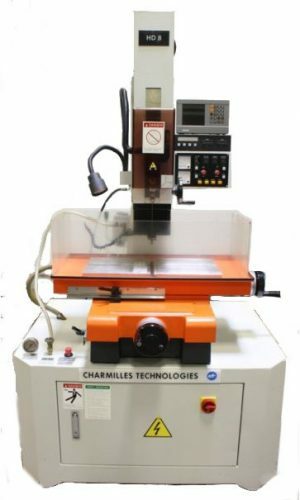 EDM is a non-contact, force-free, metal-removing process that eliminates cutting stress and resultant mechanical distortion, as well as the need to heat-treat metals. 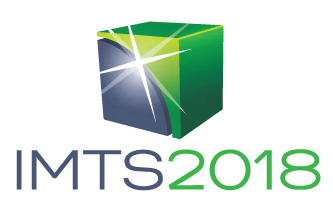 Whereas most processes for cutting harder metals involve first softening the material, machining the part, and then re-hardening, EDMs can be operated as a single cutting process--usually unmanned. 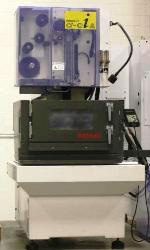 The biggest advantage to the EDM process is its incredible accuracy--up to +/-0.0001". Since the vast majority of EDMs are computer-controlled and follow preset programs, there is little need for a skilled craftsperson to monitor the process; it can be run with lights-out capability if needed. 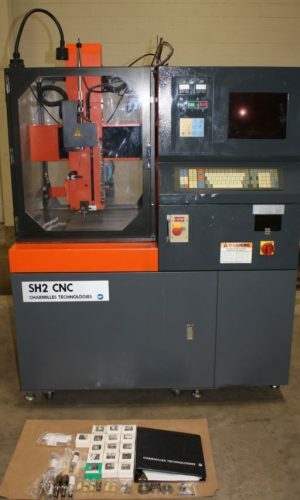 Other advantages include: the ability to cut various shapes and sizes, including curved surfaces, with extremely close accuracy and finish; the ability to machine extremely small or detailed parts; elimination of extra machining processes; burr-free and perfectly straight cuts; and reliable repeatability. For answers to your questions or more information on EDMs call Liberty at 847-276-2761 or send us an email sales@libertymachinery.com. Liberty Machinery buys and sells all types of EDMs. We are your trusted source for high quality EDM and other used equipment. The purpose of an EDM is to cut metal using electrical sparks. 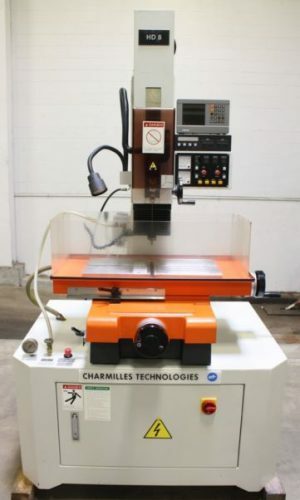 The speed of the process is controlled by how quickly the machine can produce the sparks, and the maximum cutting speed is around 4 inches per minute. There has been a lot of improvement to the process since its discovery in 1770, and wire EDMs were only introduced in the 1960s. All EDM processes can be divided into the following parts: the work tank, the dielectric fluid, the filtration system, the tool holder, the electrical pulse generator, and the electrode. The piece to be cut is placed into the work tank which is filled with the dielectric fluid (usually deionized water). This fluid provides the barrier between the electrode and the part. This is the medium through which the electricity arcs and without it the machine short-circuits and must restart. The part and electrode cannot touch. As cutting occurs, the dielectric fluid has to be cycled through the filtration system to keep it from becoming electrically charged. The tool holder is electronically controlled to keep space between the electrode and the part while moving in a programmable pattern. The electrical pulse generator is set to provide control over the sparks emitted and therefore over the cutting process. Changing voltage, for example, changes the cut. The electrode is the equivalent to the cutting tool on a traditional machine. While the electrode never actually touches the part and erosion actually occurs due to the sparks created between the two electrically conductive pieces (the electrode and the part being machined), the type and shape of electrode determines the cut. The electrode must be maintained or changed periodically as erosion occurs not only on the workpiece but also on the electrode. On a Wire EDM, a strand of metallic wire is constantly fed through a spooling system to cut in a straight line that can be angled up to 45° and controlled from either end of the feed. The wire is a consumable and can be cut up and sold for scrap after use. If an internal cut is needed, a hole must be drilled first. 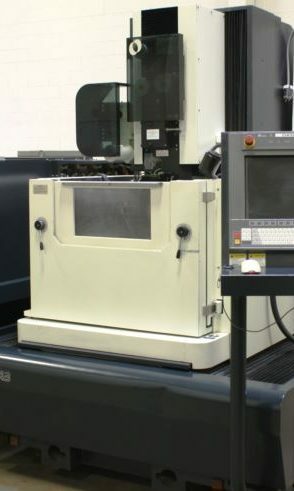 A Sinker EDM (or variously a ram, die sinker, vertical, or plunge EDM) uses either a small probe or a custom molded shape as an electrode instead of a wire. This shape is formed into the reverse of whatever part is to be cut (like a mold) and generates sparks along the entire face of the electrode. A Hole Popper (also known as a small hole EDM or micro EDM) functions like a sinker EDM but uses a hollow electrode to push high-pressure dielectric fluid through the tip and flush out debris from the hole, much like a gundrill. It was originally developed to create holes through which to feed the wire for wire EDM cutting. Liberty is always looking for used EDMs to buy for inventory. Contact us and let us know what you have for sale. We’ll be happy to give you a free quote. See our used EDMs for sale. Carl and Steve Sommer, Complete EDM Handbook (Advance Publishing, 2005), 19.